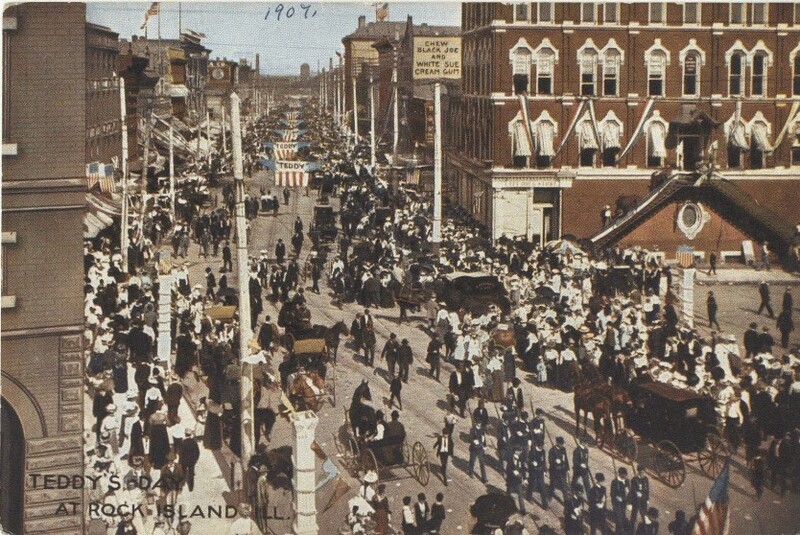 This unused postcard from Shannon Hall’s collection shows a parade along Second Avenue, apparently celebrating a visit to Rock Island by President Theodore “Teddy” Roosevelt. Someone has even penciled in a 1909 date at the top. All we had to do was find the occasion. Mr. Roosevelt visited Rock Island at least twice, the first time when he was running for vice- president in 1900 under President William McKinley and the second after he’d left the executive office. The McKinley-Roosevelt team won the election. Less than a year later Mr. McKinley became our third president to be assassinated leaving Mr. Roosevelt to step up and become, at age 42, our youngest president ever. Roosevelt was reelected in 1904 and served another full term. Three hundred Augustana College students held an impromptu parade that day, marching en masse from the college to greet Roosevelt in Davenport. But there was no formal parade in either city such as that shown on the postcard. There is another parade photo that was published in 1902 in “Picturesque Tri-Cities,” a book of photos that was sold by subscription. That parade is all but identical to ours, but it is called the 1902 Grand Army of the Republic (GAR) encampment parade. The only conclusion: Today’s postcard is a “digital” – with fingers and pen – alteration of the old GAR parade. The changes are relatively minor. “Teddy” was added to the parade banners and, somewhat strangely, a chewing gum sign was pasted over on an electric pole. Why was the postcard faked? That’s still an unsolved mystery. The GAR was an organization of Civil War veterans from the north that started in 1866, with Rock Island’s post organized in 1883. At the turn of the century, there were nine GAR posts in our county, from Illinois City to Port Byron. The May, 1902, encampment in Rock Island was the 36th for the GAR. The new Illinois Theatre building was the site for many meetings and ceremonies, called campfires. The Argus reported that 2000 marchers “braved the heat” on May 21, 1902, at 2:15 pm for the parade that is miscaptioned on our postcard. It began near 19th Street on Third Avenue and proceeded west to 12th Street, then returned via Second Avenue (although the postcard marchers appear to be facing west). The GAR lasted 83 years, holding its last national encampment in Indianapolis in 1949. Only 6 of the 16 veterans still alive were healthy enough to attend. Despite its dubious origins, the postcard provides an excellent view of the Bengston Block on the corner of 17th Street and Second Avenue as seen from the Rock Island House hotel. The Mitchell and Lynde bank building is on the far left and the roof of the Harper House hotel can be seen at the distant center. The 4-story Bengston Block is named for its owner, druggist John Bengston, who also served as Mayor of Rock Island in the 1930s. When it was built in 1875, the Argus claimed it was “considered to be the most beautiful [building] west of Chicago,” and its sturdy 32-inch thick foundation was noted. The interior was well lit by many ornate windows surmounted by arched lintels. Its two street level shops had large expanses of glass facing Second Avenue that were framed and supported by strong, yet delicate appearing cast iron columns. In 1942, the three upper stories were demolished for reasons that seemed important at the time. The building seemingly fought back. Two women who were lunching in Schlegel’s Drug Store on the first floor were fatally injured when the ceiling collapsed allowing debris to fall on them. In later years, the east storefront was given a stylish Modernistic streamlined appearance with a covering of opaque black and off-white structural glass and curved glass show windows. Such “modern” materials and design would now be considered historic in its own right. But the fancy glass didn’t last either. In more recent years, the street level store area has been remodeled several times making it one of the most remodeled buildings in downtown Rock Island. For many decades the oval window, shown on the postcard under the graceful double staircase, was visible on the 17th Street side, although the glass was replaced with brick. Now a larger doorway has replaced it. But bits of historic architecture can still be found in this 1875 building in the heavy stone lintels above the basement windows. If you’d like a better idea of the Bengston Block’s original appearance, take a look at the still-standing 2-story building next door. It’s called the Bengston Building and was identical to its neighbor except for the lower height. Although the storefront level has now been changed and a cornice is missing, the upper floors and windows are intact. Before you visit these buildings, take time to stop at City Hall or the kiosk near the entry of the downtown library and pick up your free copy of the color booklet “Walking Tour of Downtown Rock Island,” published by the Preservation Commission. You’ll enjoy the stories of many downtown buildings as well as contemporary and historic pictures. This article by Diane Oestreich is slightly modified from the original, which appeared in the Rock Island Argus and Moline Dispatch on July 18, 2004.